In 1772, William Chambers wrote of Chinese gardens, ”Their scenes of terror are composed of gloomy woods, …, impending barren rocks, ... The trees are ill formed, forced out of their natural directions, and seemingly torn to pieces by the violence of tempests” (from A Dissertation on Oriental Gardening, Sir William Chambers January 1, 1772). This beautiful grove planted with lily turf leads to teh Penjing area. This would fit right in to a modern garden. Perhaps no where are these scenes of “ill formed” trees more present than in the ancient art of penjing. Translated to mean “tray landscape,” artists manipulate the plant by confining its roots, pruning, and training branches. Moss covered rocks and small figures are added to enhance the illusion of a miniature, ancient landscape. No matter how many I have seen, they are still dazzling. Each one invites us to contemplate its intricate details and to ponder the artist’s skill in creating it. For a moment we become giants looking down on a perfectly scaled miniature world. If you enjoy Penjing, a scholar garden is the place for you. In the example above from the Humble Administrator’s Garden in Suzhou, China, there is an area set aside for the care of the tray landscapes. The most beautiful ones are placed throughout the garden as focal points. As the western gardener might put a statue or sculpture at the end of a sight line, the Chinese gardener places a tray landscape. Every gardener needs a spot to tuck their supplies. A corner of the penjing area provides the perfect spot. I wish my storage are looked so tidy. Each is so beautiful that it is hard to pick a favorite. 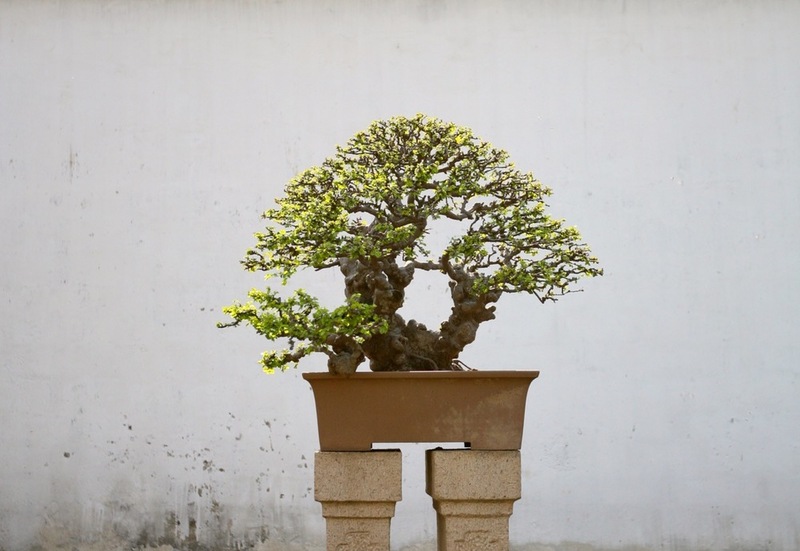 Buddhist monks introduced penjing to China thousands of years ago. The art form became popular as China enjoyed periods of wealth where art and garden-making flourished. In the 1600’s, penjing guide books were published to help the middle-class learn how to create their own tray landscapes. The Humble Administrator’s Garden was built in 1509 by Wang Xiachen. He was a retired imperial inspector. His friend, artist Wen Zhengming, visited often and made the garden famous with his many scroll paintings. The Humble Administrator’s Garden is open every day and is located at 178 Dongbei Street. Check out more posts from my visit here. A Wen Zhengming painting from 1535 of the Humble Administrator's Garden. 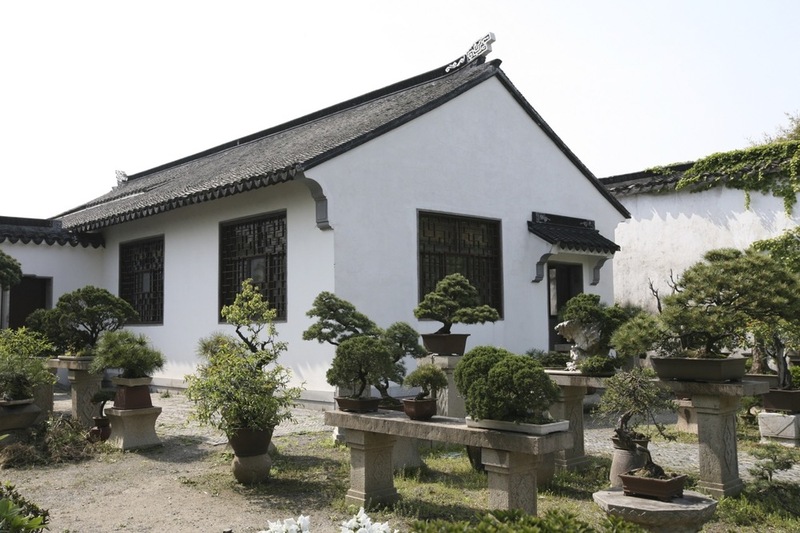 "In 1527, after an unhappy stay in Beijing, Wen Zhengming returned to Suzhou, where he was given a studio in the garden. In an album dated 1535, Wen depicted thirty-one views of the site." Source: The Met Museum.